As writers, we all know the importance of grounding our work firmly in the place where it occurs. Not by a long, involved nineteenth-century description of every leaf on every tree in sight. Just enough description to give the reader a feel for the place. For New York or London or Paris that’s not really a problem. A few words and an address will do, but Lee Carruthers’ adventures take place in Morocco and Dubai, neither of which is well-known to US readers. What to do? The Internet might have been invented for writers. You can find pictures of everything under the sun. I have fat folders of saved pictures and short historical bits about Morocco. I have fewer about Dubai, but Dubai smaller than Morocco. Online maps aren’t so good; you can’t have everything, but you can have my favorite Internet resource, Google Earth. Google Earth is an amazingly flexible program that allows you to visualize any place on earth in as much detail as you want. Roads, rivers, towns, buildings, the countryside—they’re all on display. If you want 3-D, you can have that too. With just the click of a button you can walk down the streets of major cities. Just for fun once, I found the street where the last Paris hotel we stayed in was. Then in 3-D, I popped the buildings up and found the hotel. I located the window to the room where we stayed. I went around the corner to the Moroccan restaurant where we dined. Up that street to a café where we often stopped for a snack. Besides being fun, it was a check on the accuracy of the program. The Spider Catchers is set in Fez, Morocco, and in the Algerian desert. Global Earth made the map of Fez come alive—streets, buildings, markets. It was easy to imagine I was there. Its take on the Algerian desert was even more important, since Lee Carruthers and a colleague escaped from a terrorist camp and went on the run. I could plot their path from the camp along the highway, through a sandy path between rocky hills, and up the hill where they ran out of gas and were recaptured. I could see it, describe it. I could even measure it. 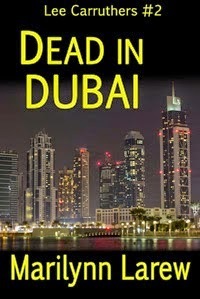 For Dead in Dubai, I found the program equally useful. The United Arab Emirates is a 600 kilometer long collection of small Arab states with its front on the Persian Gulf across from Iran and its back to the Rub' al Khali, the “empty quarter” in the Saudi Arabian desert. In some places it’s as much as thirty-five kilometers wide, each green inch painfully built using desalinated seawater. Long and narrow, Dubai is a fabulous and complicated place, originally built around a freshwater creek that allowed the old pearl fishing village to survive. Today the creek divides the emirate into two unequal parts with hotels, shopping centers, docks, and an old quarter of neighborhoods and souks just like the old days. Dubai also has divided highways, golf courses, tall towers like the ones on my book cover that have office and apartment space, and a huge new port, Jebel Ali, capable of docking an American aircraft carrier with room to spare. That’s a lot to describe. Global Earth allowed me to zero in on the place and view the whole scene in 3-D.
You can download pictures, yes, but pictures won’t give you an idea of the whole place. Google Earth will. It will allow you to see the entirety or drill down and magnify any part of it to see the detail. Okay. I’m a map junkie. I admit it. I’ve got a map of every place I’ve ever been. Sure, I love maps, but Google Earth has helped me see and write about two places I’ve never been in such detail that reviewers are convinced I’ve been there. I think it will help you ground your stories as well. MARILYNN LAREW is a historian who has published in such disparate fields as American colonial and architectural history, Vietnamese military history, and terrorism, and has taught courses in each of them in the University of Maryland System. Before settling on the Mason-Dixon line in southern Pennsylvania, she lived in Nebraska, Iowa, Missouri, Georgia, Wisconsin, Ohio, South Carolina, Maryland, in Manila, and on Okinawa. It’s no surprise that she likes to travel. When she’s climbing the first hill in Istanbul to Topkapi Palace, strolling around Hoan Kiem Lake in Hanoi, or exploring the back streets of Kowloon, she is not just having fun, she’s looking for locations for her next novel. When she’s not traveling, she is writing or reading. She writes thrillers and likes to read them. She also likes to read Vietnamese history and Asian history in general, as well as military history. She lives with her husband in a 200-year-old farmhouse in southern Pennsylvania. She belongs to Sisters in Crime, the Guppies, and the Chinese Military History Society. Setting is so important for books, especially mysteries I think, so am glad to learn more about how authors go about crafting the setting for their stories. Thanks so much for sharing all this information with us!